ACHeck21 provides robust, cloud-based Fintech, including applications for ACH, Check 21, and remote deposit capture. Since 2002, our technology has been making transaction processing quick, simple, and accessible. Build software to provide payment functionality directly to your customers. Bring your own bank, or bank with us. Easily integrate processing output with your existing system. 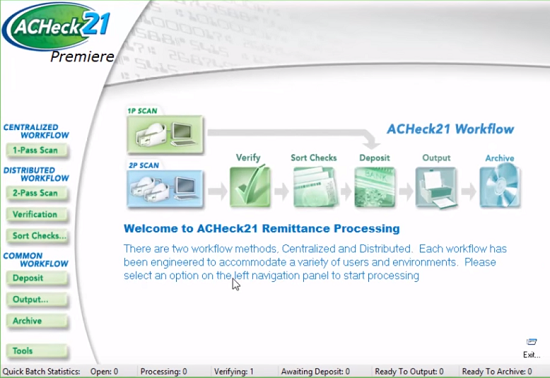 ACHeck21 check imaging remittance systems update bookkeeping systems & are compatible with over 100 models of scanners. FinTech Cloud enables you to quickly and easily process ACH and Check 21 payments, both for use in your organization, and in apps you develop and license to customers. Sheri Rankin - GRBSolutions, Inc.
With ACHeck21 Micro, you can take advantage of the convenience of remote check deposit, but in a much faster, more automated way. ACHeck21 Micro also lets you integrate with your bank faster than other solutions. Additionally, ACHeck21 Micro is lightweight, easy to install, and enables customization with a SOAP API. 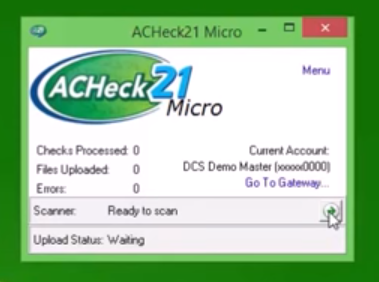 Learn more about the ACHeck21 Micro remote deposit capture application. ACHeck21 Premiere equips your business with a full suite of processing capabilities to streamline even the most complex remittance operations. ACHeck21 Premiere Intelligent Routing dynamically reduces your costs by converting eligible checks to ACH, and non-eligible checks to Check 21. Quickly scan multiple document types and reduce costs by automatically identifying which items can be converted to ACH. Learn more about the ACHeck21 Premiere check imaging remittance program. Stay Informed. Receive up to date information from our industry. We are ready to show you want our products can do.